I have made no secret of my strong belief that the UK would be foolish to leave the European Union (see “What has the EU ever done for us?“). Until now, I have argued the case for our environment being better protected by EU regulations and enforcement procedures. However, that is only part of the reason that I will be voting to stay in the EU on June 23. The emotional heart of my argument is encapsulated in the two photographs above. 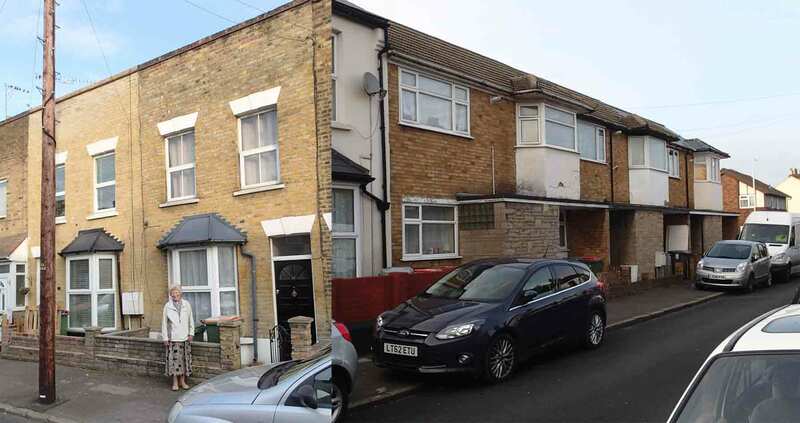 They both show the road, Suffolk Street, in Forest Gate, East London, where my mother and her family lived during the Second World War. The left hand picture shows my mother standing outside the house where she was brought up. Like almost every house in the street it is a 19th century terraced house, with two rooms upstairs and three downstairs. Right up to the time my grandmother died in 1989 it had an outside toilet and no separate bathroom. The right hand picture shows three houses built in the 1960s that stand about 100 metres further along the road from my mother’s house. Those houses stand on the site where a German V1 flying bomb landed in 1944. My grandmother, mother and uncle emerged from the air-raid shelter at the end of their small garden to find their windows blown in and a gaping hole between two of the downstairs rooms. I still remember seeing the crack in the wall when I visited as a child. My mother’s favourite doll also lost one of its arms during the attack. Seventy years on, I spend a proportion of my working life working with the European Union, and have a reasonable idea of the realities of getting representatives of 28 different countries to agree on a common path. It is not always easy, and sometimes there are frustrations and disagreements. The lack of uniformity across Europe is part of what makes travelling around the continent and working with people from other countries a generally rewarding experience. We share many values, but the expression of those values is shaped by different cultures and histories. Finding a way through the problems and disagreements is not always easy, but a brief pause to reflect on how far we have all travelled since Britain and Germany dropped bombs on one another is enough to put these disagreements into perspective. Being in Romania also served as a reminder of the role that the EU played in encouraging democracy and economic development in the former communist states. Liam Fox, the former Conservative Defence Secretary – and prominent “out” campaigner was scornful of the suggestion that the EU contributes to peace. That, he claimed, was due to NATO, not the EU. That betrays a very limited understanding of “peace” as no more than “not war”. “Peace” is a far bigger concept than Liam Fox’s definition, embracing all the interactions we have that make war inconceivable. NATO, at best, contributes to a sense of security in situations where true peace has already failed. But that’s a topic for another day. 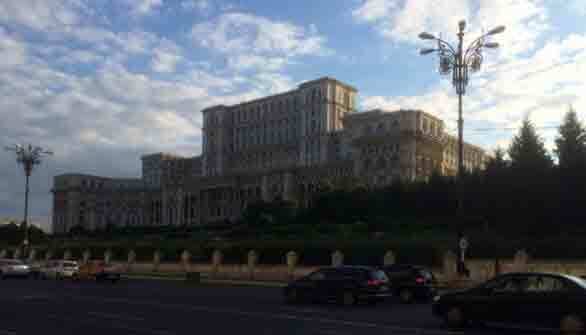 The Palace of the Parliament (“Casa Poporului”) in Central Bucharest, built on Nicolae Ceauşescu’s orders: a reminder of Romania’s Communist past.